The Ferrari 250 GT Berlinetta Lusso is a GT car which was manufactured by Italian automaker Ferrari from 1963 to 1964. Sometimes known as the GTL, GT/L or just Lusso, it is larger, the 250 GT Lusso, which was not intended to compete in sports car racing, is considered to be one of the most elegant Ferraris. Keeping in line with the Ferrari tradition of that time, the 250 GT Lusso was designed by the Turinese coachbuilder Pininfarina, although the interior was more spacious than that of the 250 GT, the 250 GT Lusso remained a two-seat GT coupe, unlike the 250 GTE. The car was manufactured for only eighteen months, from early 1963 to mid 1964, auto shows often provide an opportunity for manufacturers to introduce new designs publicly. 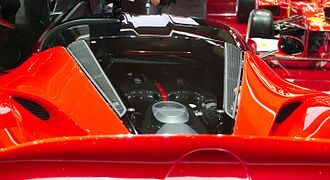 Ferrari did so at the 1962 Paris Motor Show to unveil, as a prototype, the prototype was almost identical to the production version, and only minor details changed thereafter. The new model was a way for Ferrari to fill a void left between the sporty 250 GT SWB and the luxurious 250 GTE 2+2, the Lusso met the new demands of the 1960s. 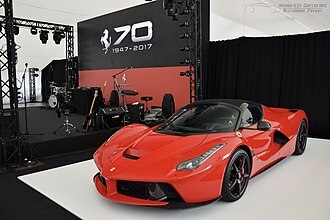 Indeed, fans of sporting driving of the time became as fond of civilized designs, Ferrari did not skimp on details in the GTL, which shows on the scales, weight ranged from 1,020 to 1,310 kg, depending on equipment. Unusually brief for a Ferrari model, GTLs production began January 1963, according to a longstanding American expert on Ferrari, Peter Coltrin, the construction of the 250 GT Lusso must have begun soon after the presentation of the prototype of the Paris Motor Show. Although it was not intended to compete, the 250 GT Lusso made a few appearances in several sporting events in 1964 and 1965, such as the Targa Florio and the Tour de France. 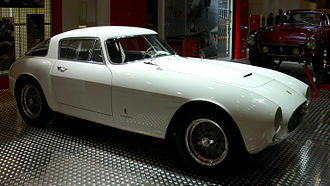 The final iteration of the 250 GT series,351 copies of GT Lusso were produced before being replaced by the Ferrari 275 GTB, as usual, the company Carrozzeria Scaglietti was responsible for the manufacturing of the body. 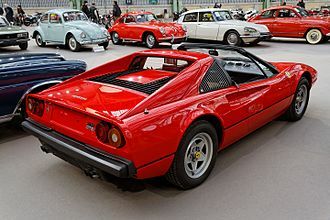 The body was made of steel with the exception of the doors, boot lid, and bonnet, the stern of the body featured a small integrated spoiler, the 250 GTL became the first Ferrari to incorporate such aerodynamic appendages, concluding with an abrupt Kammback rear. The short rear is characterized by a bezel that slopes down to the tail of the car, the glazed surfaces, including the rear window and triangular quarter windows, provided good visibility. As the car was only a two-seater, there was a fairly capacious boot space with a parcel shelf, while 250 GT Lusso was a civilized sport car, it was nevertheless recommended in preference to young and flexible passengers due to the fixed-position seatbacks. Despite this, the pedals were adjustable to 5 cm, as in the racing versions, five additional gauges were positioned in front of the driver, behind the three-spoke Nardi steering wheel made of wood and aluminum, placed almost vertically. 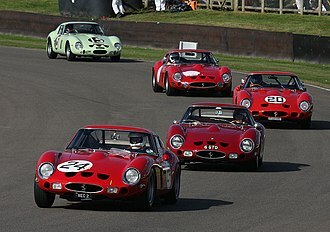 Contrary to the 250 GTE 2+2 which had a wheelbase of 2.6 m, the chassis was adopted from the tubular structure of the 250 GTO, but with narrower tubes. 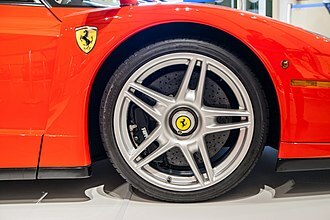 The chassis could, according to Brian Laban, author of Ferrarissime, braking was provided by four-wheel disc brakes with hydraulic control, placed behind the polished aluminum Borrani wire wheels with single knockoffs. A Ferrari Berlinetta Boxer is one of a series of cars produced by Ferrari in Italy between 1973 and 1984. They used a mid-mounted flat-12 engine, replacing the FR layout Daytona and it was designed by Leonardo Fioravanti. 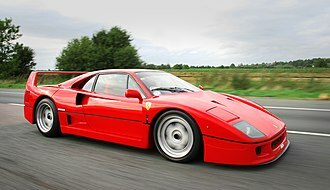 The Boxer was the very first mid-engined road-car to bear the Ferrari name, no BB was ever originally sold in North America, as Enzo did not believe it to be worth the cost of complying with the extra environmental and safety regulations. 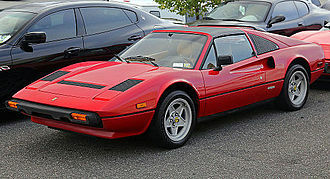 However, third parties made conversions, and quite a few of them are now in the United States, production of the BB was a major step for Enzo Ferrari. He felt that a road car would be too difficult for his buyers to handle. This attitude began to change as the marque lost its dominance in the late 1950s to mid-engined competitors. The mid-engined 6- and 8-cylinder Dino racing cars were the result, the company moved its V12 engines to the rear with its P and LM racing cars, but the Daytona was launched with its engine in front. It was not until 1970 that a mid-engined 12-cylinder road car would appear, the first Boxer was the 365 GT4 BB shown at the 1971 Turin Motor Show. Designed to rival the Lamborghini Miura and the newly developed Lamborghini Countach,387 were built, of which 88 were right-hand drive, making it the rarest of all Berlinetta Boxers. The Pininfarina-designed body followed the P6 show car with popup headlights, though it shared its numerical designation with the Daytona, the Boxer was radically different. It was a car like the Dino, and the now flat-12 engine was mounted longitudinally rather than transversely. It has 380 hp which is slightly higher than the Daytona. 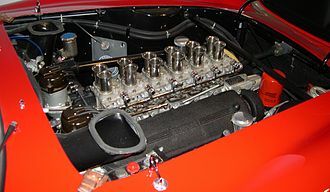 The engine shared its dimensions with the V12 from the Daytona. One major difference in engine was its use of timing belts rather than chains. 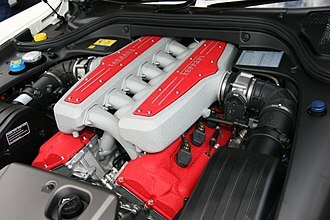 Although referred to as a Boxer, the 180° V12 was not a boxer engine. 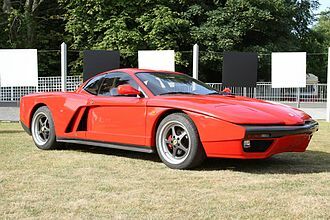 The 365 GT4 BB was updated as the BB512 in 1976, the name 512 referred to the cars 5 liter,12 cylinder engine, a deviation from Ferraris established practice of naming 12-cylinder road cars after their cylinder displacement. 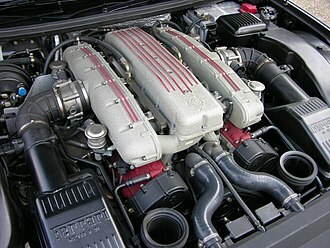 The engine was enlarged to 4943.04 cc, with a compression ratio of 9.2,1. 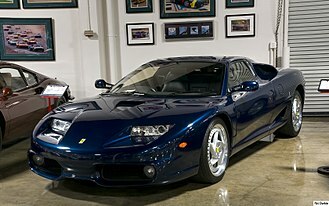 The Ferrari F355 is a sports car built by Ferrari from May 1994 to 1999. It is an evolution of the Ferrari 348 and was replaced by the Ferrari 360 and this new head design allowed for better intake permeability and resulted in an engine that was considerably more powerful, producing 380 PS. The longitudinal 90° V8 engine was bored 2mm over the 348s engine, engine internals are produced using lightweight materials, the connecting rods are forged in Ti6-Al-4V titanium alloy. The engines compression ratio is 11,1 and employs the Bosch Motronic M2.7 engine control unit in the 1995 model year, the Motronic system controls the electronic fuel injection and ignition systems, with a single spark plug per cylinder. Engine lubrication is via a dry-sump oiling system, the car allows selection between two damper settings and Sport. Ferrari fitted all road-going F355 models with Pirelli tires, size 225/40ZR18 in front, although the F355 was equipped with power-assisted steering, this could optionally be replaced with a manual steering rack setup by special order. Aerodynamic designs for the car included over 1,300 hours of wind tunnel analysis, the car incorporates a Nolder profile on the upper portion of the tail, and a fairing on the underbody that generates downforce when the car is at speed. 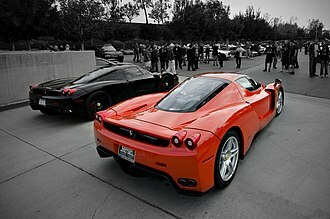 At launch, two models were available, the coupe Berlinetta priced at $130,000, and the targa topped GTS, the Spider version, priced at $137,000, was introduced in 1995. 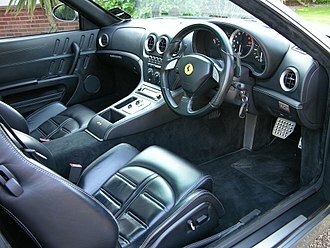 In 1997 the Formula One style paddle gear shift electrohydraulic manual transmission was introduced with the Ferrari 355 F1 adding £6,000 to the asking price. 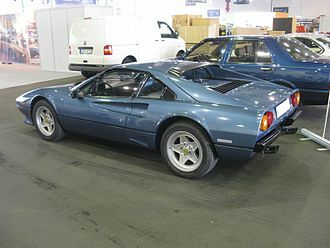 The F355 was the last in the series of mid-engined Ferraris with the Flying Buttress rear window, the nomenclature does not follow the formula from the previous decades, i. e. engine capacity followed by number of cylinders. For the F355, Ferrari used engine capacity followed by the number of valves per cylinder to bring the performance advances introduced by a 5 valve per cylinder configuration into the forefront, total production of 11,273 units made the F355 the most-produced Ferrari at the time. 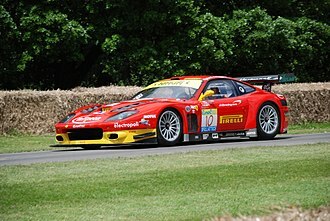 The Ferrari 575M Maranello is a two-seat, two-door, grand tourer built by Ferrari. 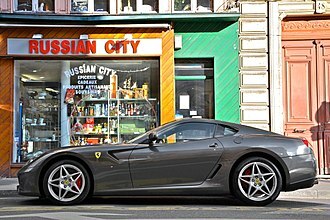 Launched in 2002, it is essentially an updated 550 Maranello featuring minor styling changes from Pininfarina, the 575M was replaced by the 599 GTB in the first half of 2006. 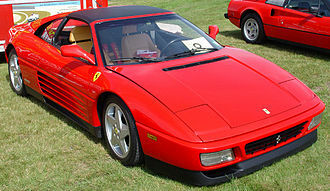 Two six-speed transmissions were available, a manual gearbox and, for the first time on a Ferrari V12. The model number refers to engine displacement in litres, whilst the M is an abbreviation of modificato. For 2005, the company developed a new GTC handling package and Superamerica version, configuration, 65° V12 engine Displacement,5.2 seconds 0–400 m,12.25 seconds 0-1,000 m,21. The new brakes were based on the companys Formula One technology and they used 15.7 in discs with six-piston calipers in front and 14.2 in discs with four-piston calipers in the rear. Patented Revocromico roof incorporates carbon fibre structure that is hinged on the axis with a luggage compartment lid. With the roof open the window, apart for holding the third stop light. Monza SP2 at the 2018 Paris Motor Show. Portofino interior still offers very limited rear seating.